Mountain Beltway by Callan Bentley is licensed under a Creative Commons Attribution-Noncommercial- Share Alike 3.0 United States License. That means you can use the stuff you find here, repost it with attribution to the author, and "remix" it for your own purposes, but not with the aim of making money off of it. Educators especially: I encourage you to use anything you find here that is useful to your mission educating people about Earth science. E-mail me if it would help to have a larger or higher-resolution version of any of the images. 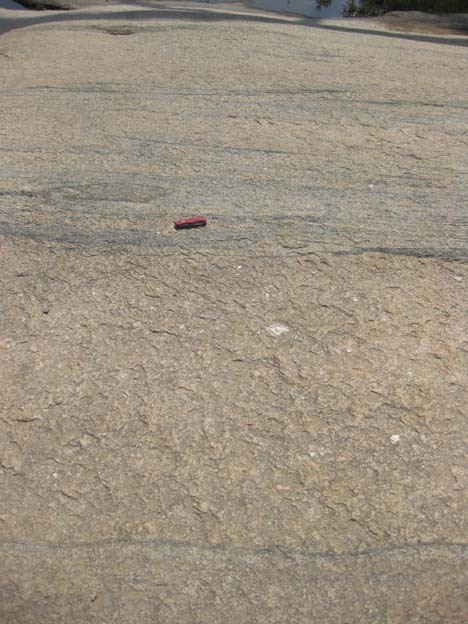 As far as this project goes, we are interested in these dikes for the information that they (potentially) contain about the orientation of the Earth’s magnetic field in Virginia at the time of the supercontinent Rodinia’s breakup. 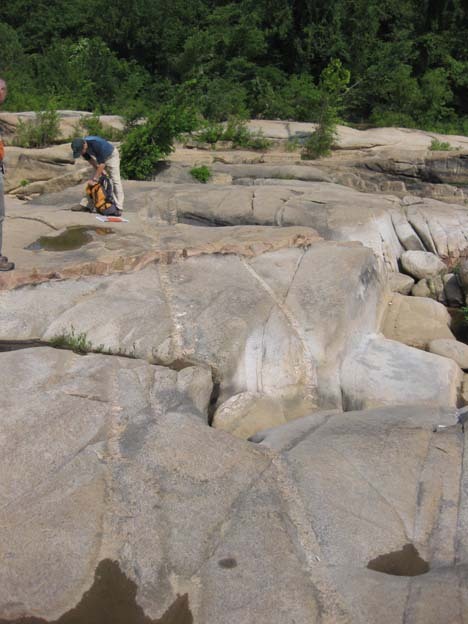 By sampling these dikes and then analyzing the samples at their paleomagnetism lab back in Ann Arbor, Fatim and Matt hope to put some constraints on the question of paleo-Virginia’s latitude when these dikes cooled into solid rock. 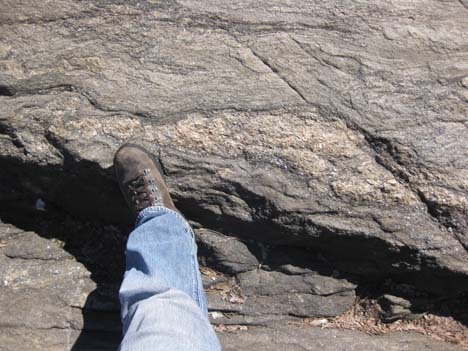 As a reminder, you are not allowed to sample any rocks in any national park unless you have first applied for and been granted a research sampling permit by the National Park Service. 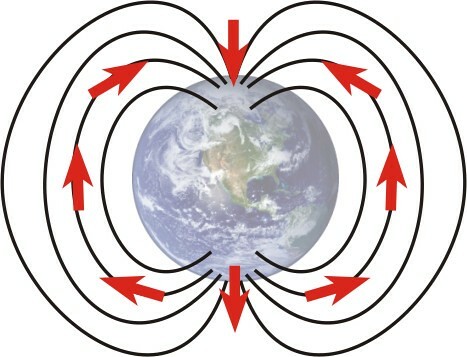 A magnetically-sensitive mineral forming in a modern rock would have an upward-oriented high-angle magnetism if it formed at high southerly latitudes, a moderate-angled upward orientation at moderate southerly latitudes, a horizontal, northward-pointing orientation at the magnetic equator, and then the reverse as you head towards the north pole: a moderate-angled downward orientation at moderate northerly latitudes, and a downward-oriented high-angle orientation if it formed at high northerly latitudes, just like the red arrows show in the above image. 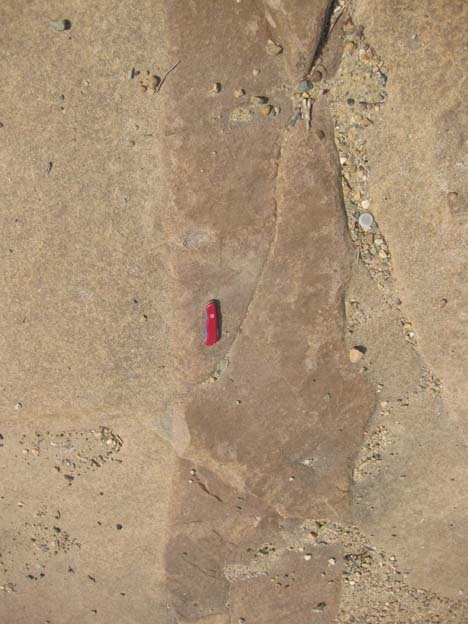 So the angle of inclination of a fossil magnet should be the same regardless of whether it’s poking up or plunging down, relative to the surface of the Earth. 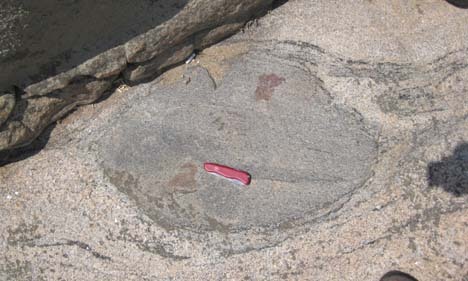 In this way, paleomagnetism can reveal the approximate latitude (but not longitude) at which a rock formed. But wait, is it really so simple? No, of course not. Check out the map below, showing the positions of the north geomagnetic pole over the past 2000 years, with numbers showing the position of the pole in a specific year CE. It moves! The circles around geomagnetic poles at 900, 1300, and 1700 CE are 95% confidence limits on those geomagnetic poles; the mean geomagnetic pole position over the past 2000 yr is shown by the square with stippled region of 95% confidence. These data were compiled by Merrill and McElhinny (1983) and plotted by Butler (1982). 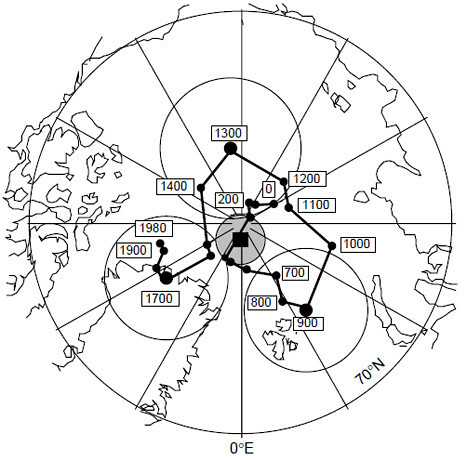 So this map shows us that even though the magnetic pole does wander about a bit, 2000 years of data is enough to generate an average which is more or less coincident with the geographic pole. And therefore a statistically significant batch of data (spread over a 2000-year-or-greater spread of time) will also reflect that average pole position. 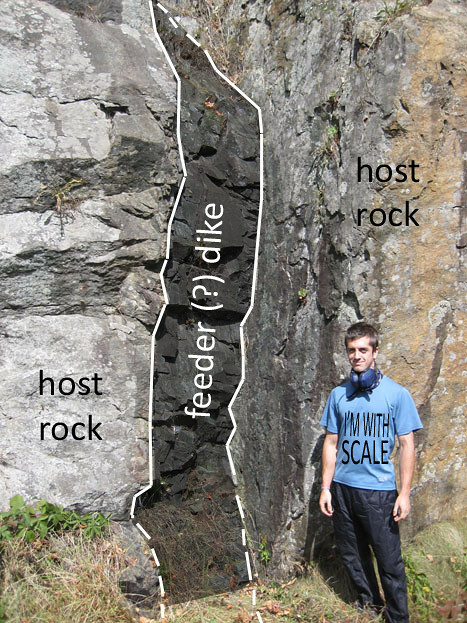 You sample a dike and its surrounding host rock, at several distances away from the dike. You find that they all give you the same magnetic orientation. 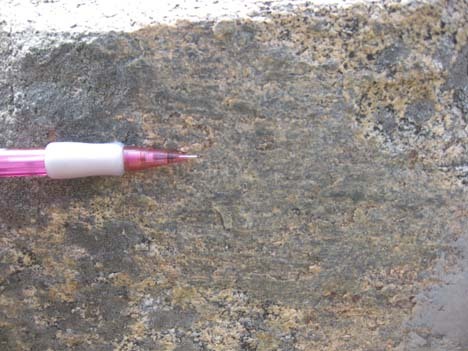 This suggests you have the magnetic signature of a later overprinting, not the original orientations of dike and host rock. Now what if you found this, instead? 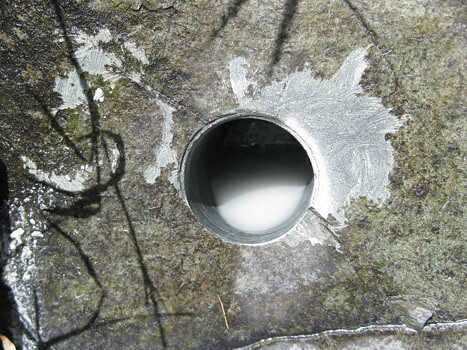 Passing the contact test is critical to tying the two rocks’ magnetic data to their age data. It’s only with a positive contact test that you can use this data to say anything about where Virginia (and thus ancestral North America, often dubbed “Laurentia”) was when the Catoctin dikes were intruded. The contact test is something that our team wanted to repeat, with more dikes than just the two that were featured in the Meert, et al. (1994) paper. We also wanted to double-check their results, and verify, reject, or modify them as our data warranted. 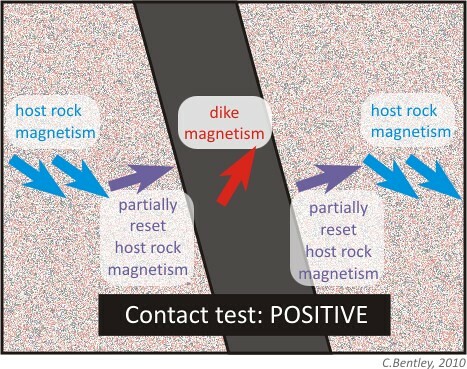 The key to constraining the magnetic orientation of these rocks as precisely as possible is to constrain the current orientation of the samples as precisely as possible. 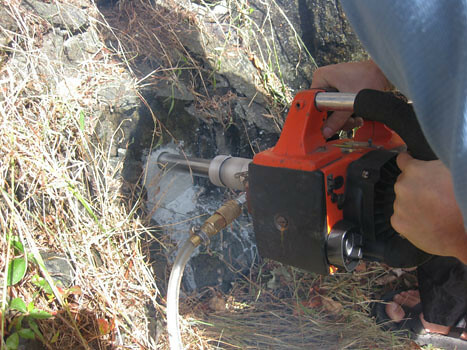 We measured the strike and dip of the surface of each sample very carefully, before we extracted it from the bedrock. 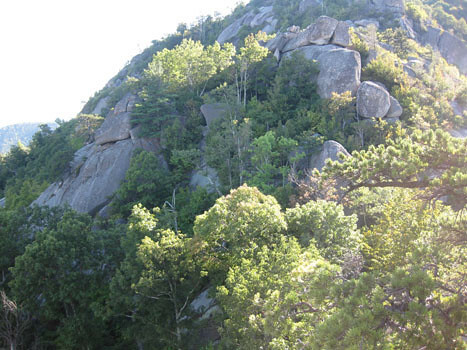 At Old Rag Mountain, we were not allowed to drill (Old Rag is a wilderness area with no motorized equipment allowed), so we were collecting oriented hand samples. 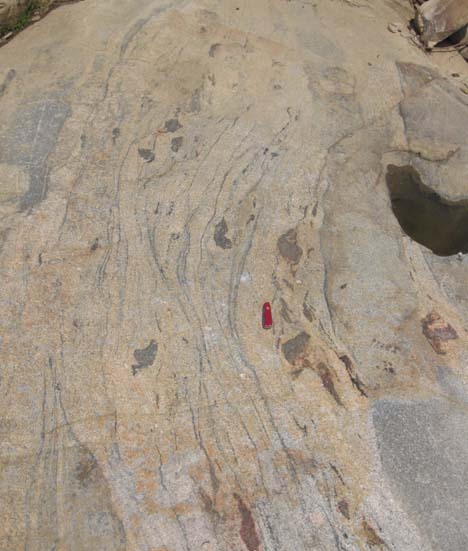 Because these rocks are inherently magnetic (that’s why we’re sampling them, after all! 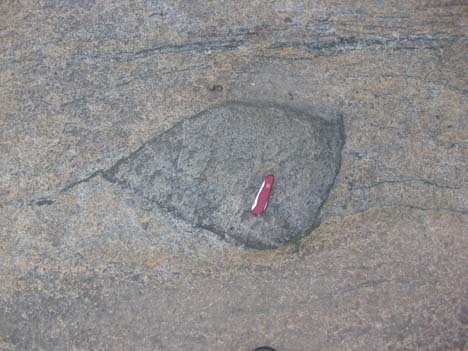 ), we have to control for the possibility that the rocks themselves might be throwing off our Brunton compass needles. 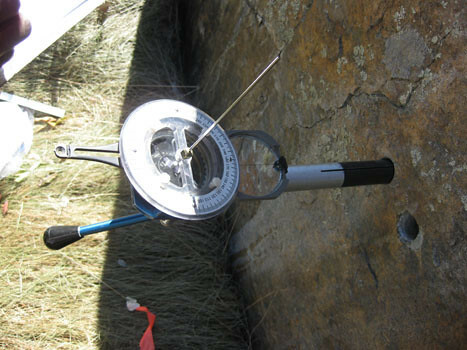 A second compass is employed to control for any magnetic field coming off the rocks themselves. 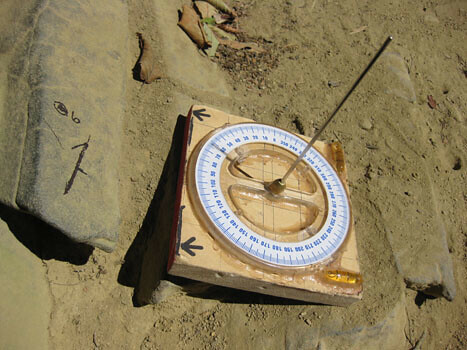 This is a solar compass. 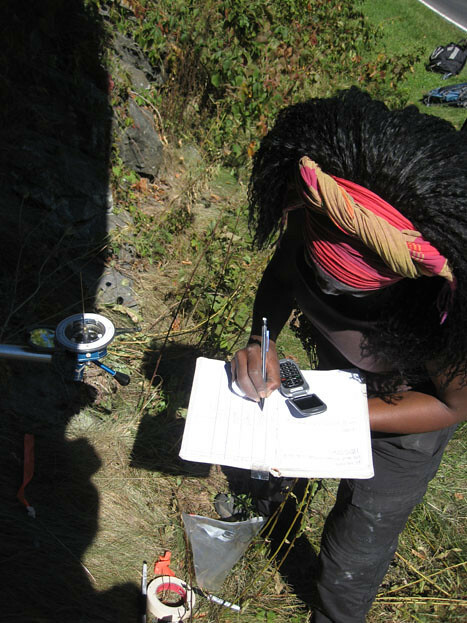 If you know exactly where you are (note Fatim’s GPS unit in the above photo), and when you are taking the measurement, you can use this solar compass to double-check the orientation you get from the Brunton compass. 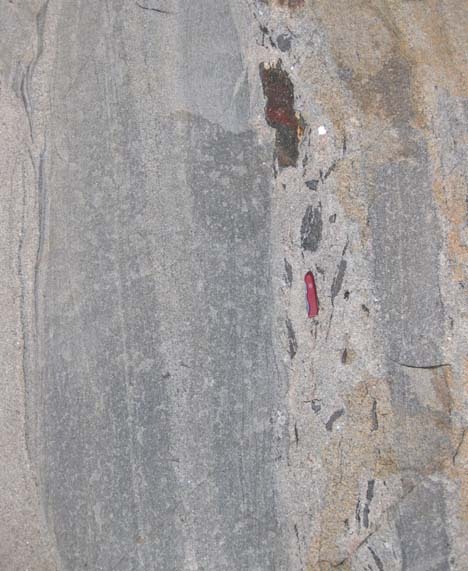 Okay, petrologists, I want to hear from you: How should I interpret this? 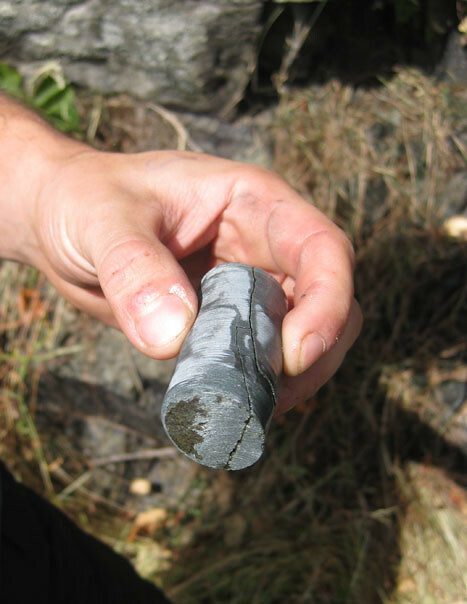 In our field area, a core this size of the dike rock takes about ten minutes to extract. 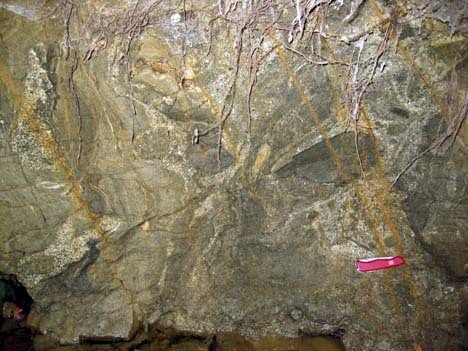 Basement rock (host rock) takes longer, as it’s made of harder minerals. 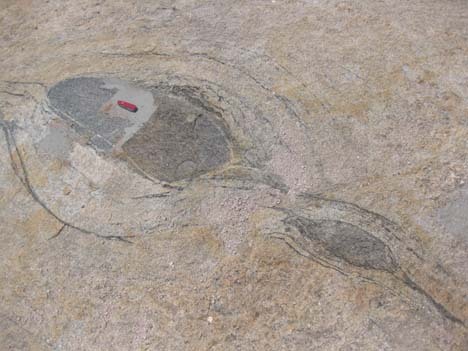 This way, if the core snaps off, you can line up its arc with the rest of the circle inscribed on the outcrop next to the hole. Whew! Core saved! Fatim and Matt sampled for two more days after I had to leave them due to other obligations, like teaching. They are headed back to Michigan today. 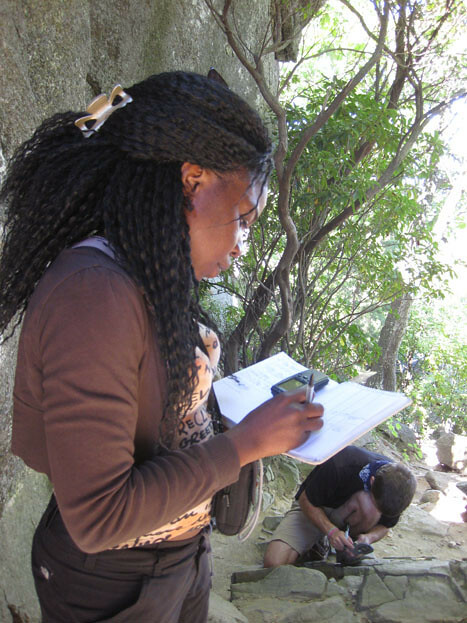 Soon, hopefully, we’ll see whether our sampling campaign yields any meaningful results… Stay tuned! 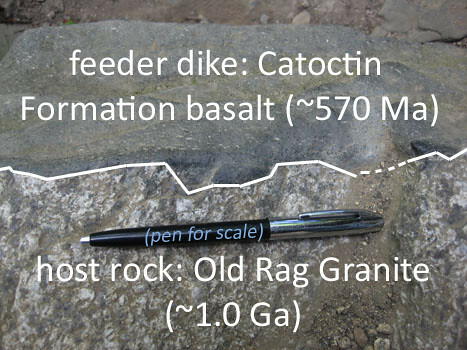 As a final note, I would like to point out that this collaboration was born when Fatim read my blog post on feeder dikes and then proposed that we combine her paleomag skillz with my dike-location knowledge. 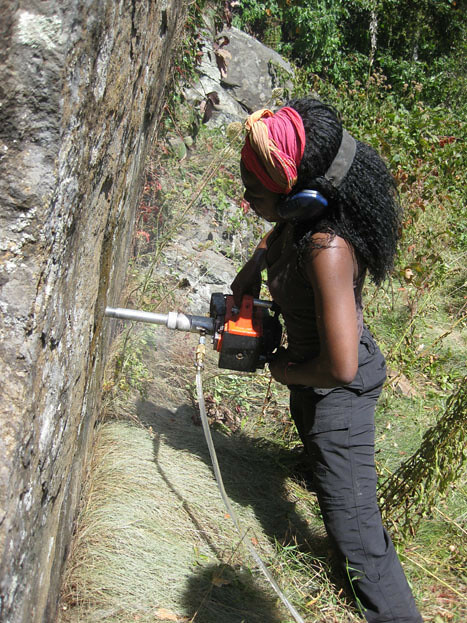 It’s not the first time that my blogging has yielded a great opportunity, but it seems to be a shining example of how virtual connections online can lead to tangible work in the real world. The blog-curious should take note. R.F. Butler. 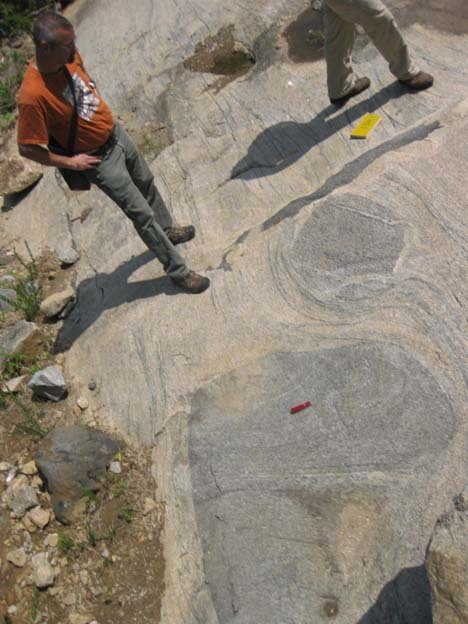 PALEOMAGNETISM: Magnetic Domains to Geologic Terranes. Originally published by Blackwell in 1984, 248 pp. Updated online 2004. 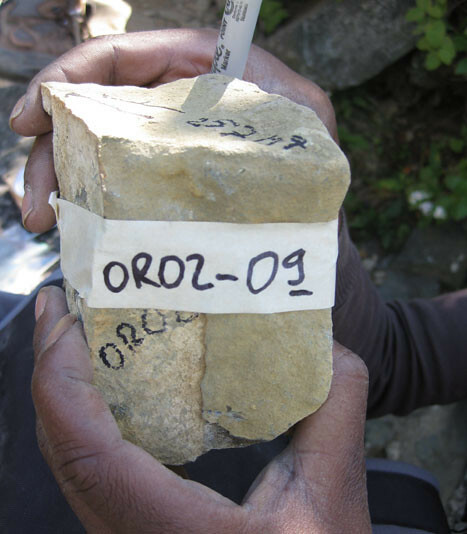 Retrieved September 15, 2010, from http://www.pmc.ucsc.edu/~njarboe/pmagresource/ButlerPaleomagnetismBook.pdf. J. G. Meert, R. Van der Voo, and T.W. Payne. 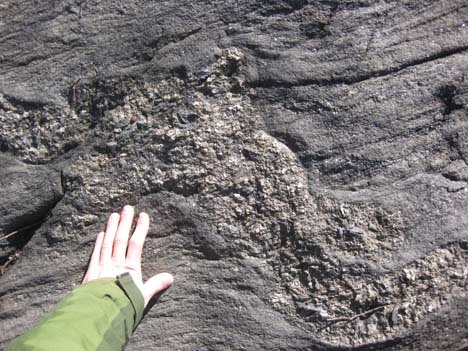 “Paleomagnetism of the Catoctin volcanic province: A new Vendian-Cambrian apparent polar wander path for North America,” March 10, 1994. Journal of Geophysical Research 99, No. B3, pp. 4625-4641. 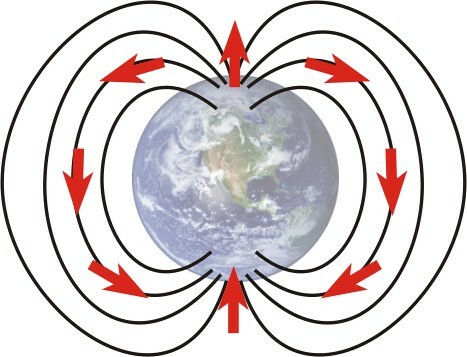 R. T. Merrill and M. W. McElhinny, The Earth’s Magnetic Field, Academic Press, London, 401 pp., 1983. 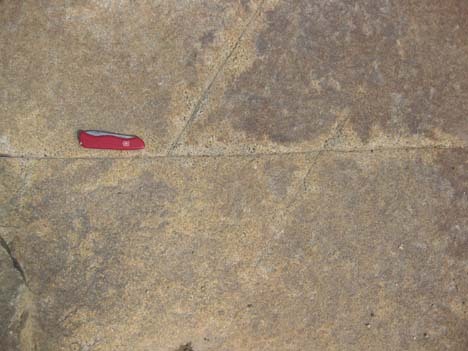 In my previous post, I introduced you to the Petersburg Granite, as it is exposed south of Belle Isle, at the falls of the James River in Richmond, Virginia. I mentioned that it was fractured, and I’d like to take a closer look at those fractures today. 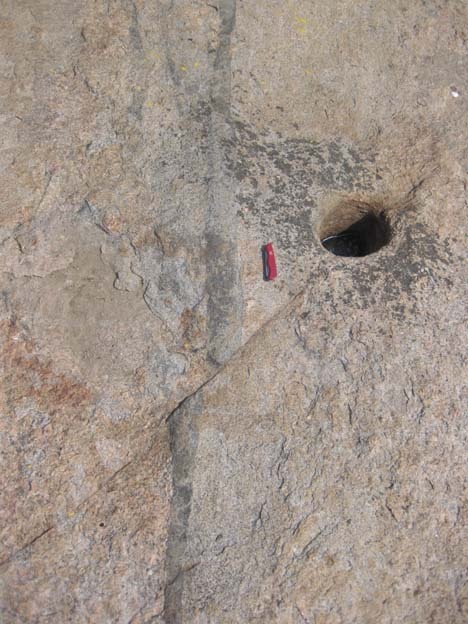 The geologically-imparted fractures were exploited by human granite quarriers, and in some parts of the river bed, you can see the holes they drilled to break out big slabs of the rock. 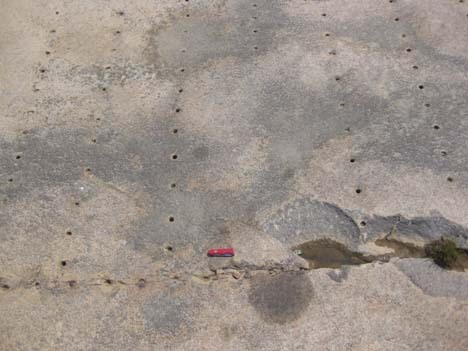 Some of these block-defining perforations exploited pre-existing fractures. 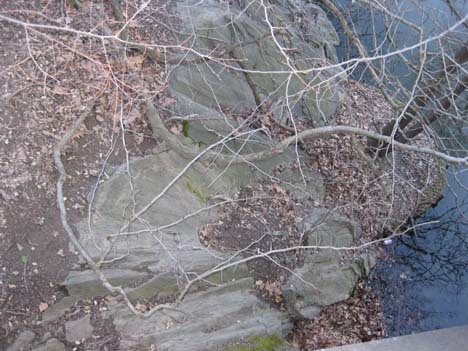 This is also evident on the north side of Belle Isle itself, where there are several large abandoned quarries now mainly utilized as a rockclimbing locale. 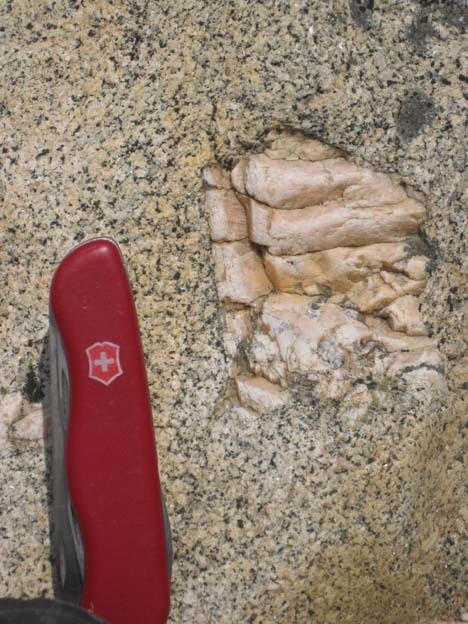 There are two dominant fracture sets in the area: one which parallels the schlieren (magmatic fabric), striking NNE; and a second which strikes ENE. 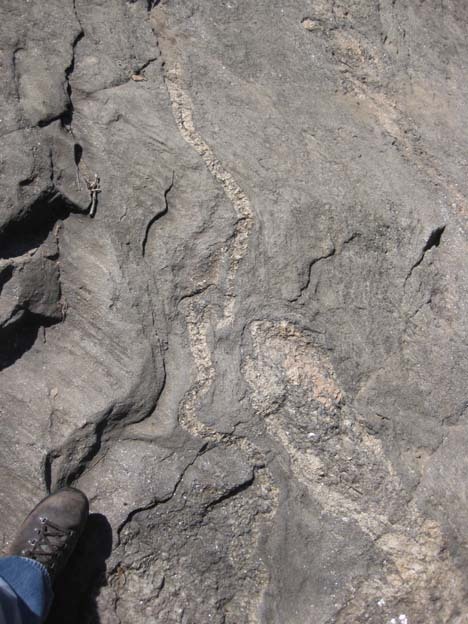 The meaning of these fractures are one of the problems Chuck Bailey (my host at Belle Isle) and his students have been considering. 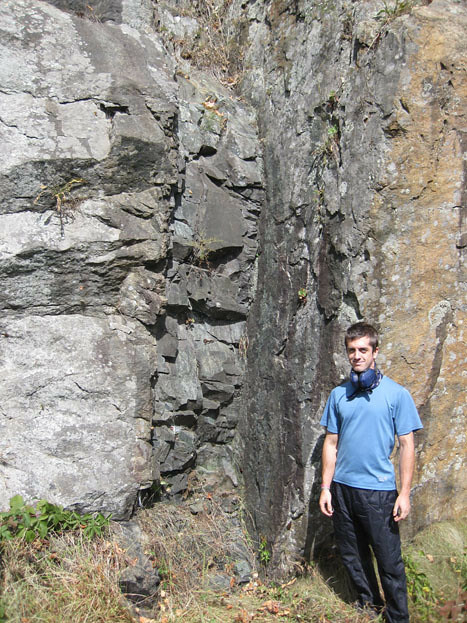 Under Chuck’s tutelage, James McCulla examined these fractures and reported his findings at the NE/SE GSA section meeting in Baltimore last March. Yep, the slicks are very gently plunging (close to horizontal) and agree with the right-lateral offset we thought we saw in the horizontal exposures in the earlier photos. These are in fact true right-lateral offsets. 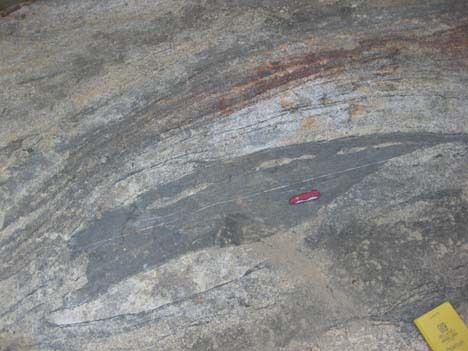 Chuck is currently dating some muscovite that appears on these surfaces as a method of constraining the timing of deformation. 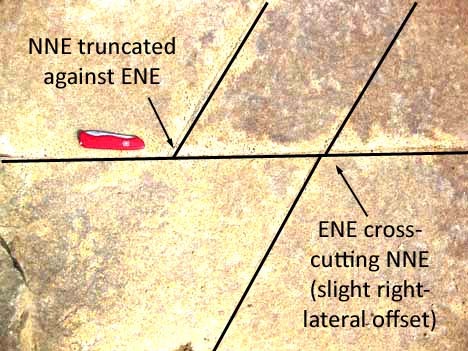 Chuck and James therefore interpret the NNE-trending fractures as extensional fractures and the ENE-trending fractures as faults with small offsets. 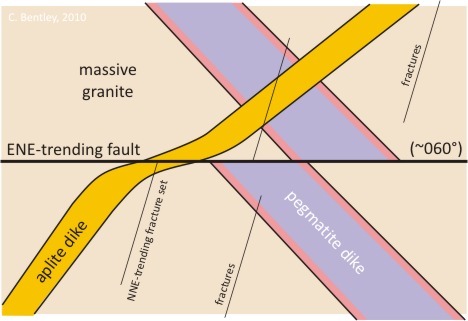 It is worth noting that the NNE-trending extensional joint set is parallel to extensional faults in the Richmond Basin, a Triassic rift valley 15 km upstream. We have two different relationships exposed here, less than a foot apart. 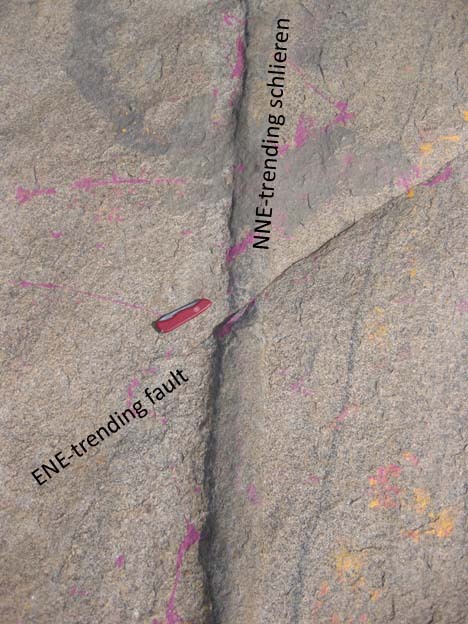 At left, we see the NNE-trending joints truncating against the ENE-trending “fault.” At right, we see that the NNE-trending fracture steps to the right as it crosses the ENE-trending fracture. 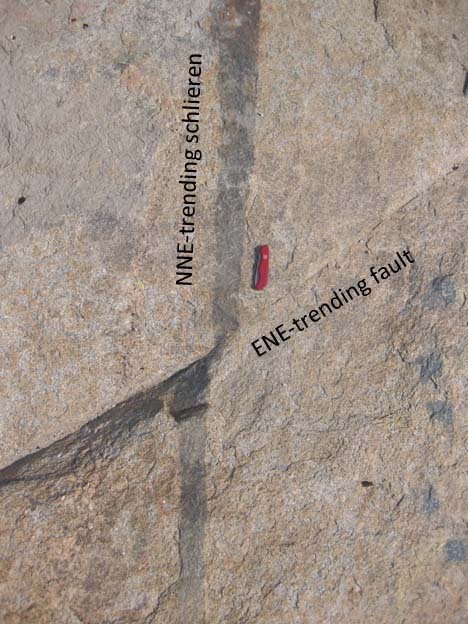 The left example suggests that the ENE “fault” is older, and the NNE joint came later, propagating to the pre-existing discontinuity but no further. 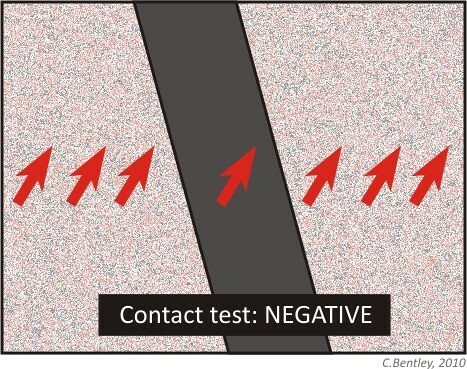 The right example suggests that the NNE-trending joint was there first, but was then broken and offset (ever so slightly) in a right-lateral fashion, like the offset schlieren in the photos earlier in this post. 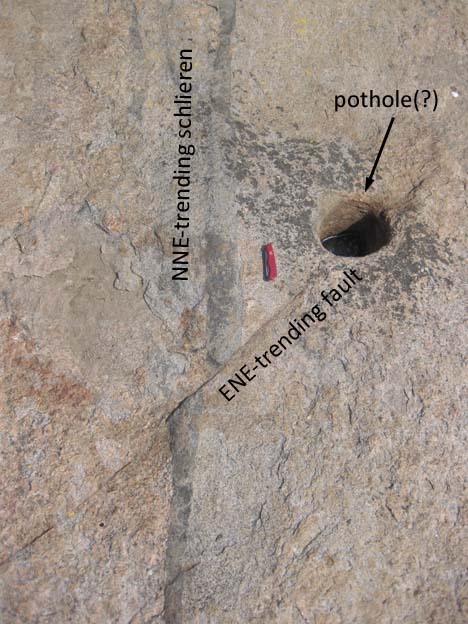 In other words, the ENE “fault” is younger. 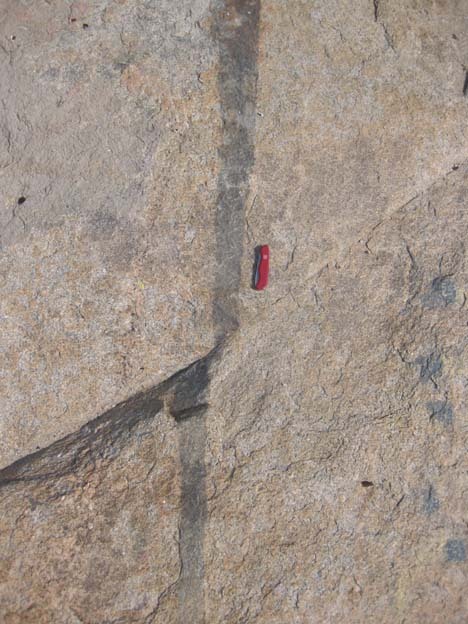 “Geology isn’t rocket science.” We know what’s going on with rockets — we built those suckers! This, on the other hand, is a bit more complicated! 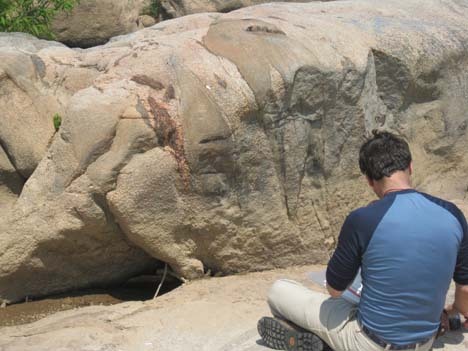 Anyhow, Chuck and James have been over these rocks like gravy on rice, and they have documented many other instances of cross-cutting relationships. 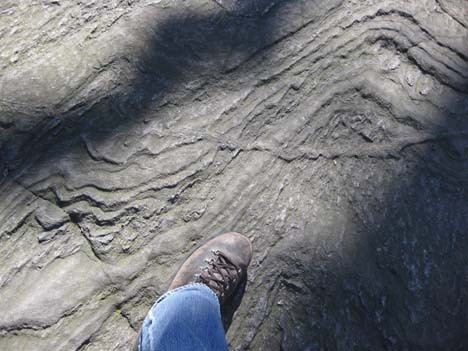 As James’ GSA abstract notes, they found enough exposures to feel confident interpreting the ENE-oriented set to be the older set to have formed as a result of WNW-directed contraction during the Alleghanian Orogeny. 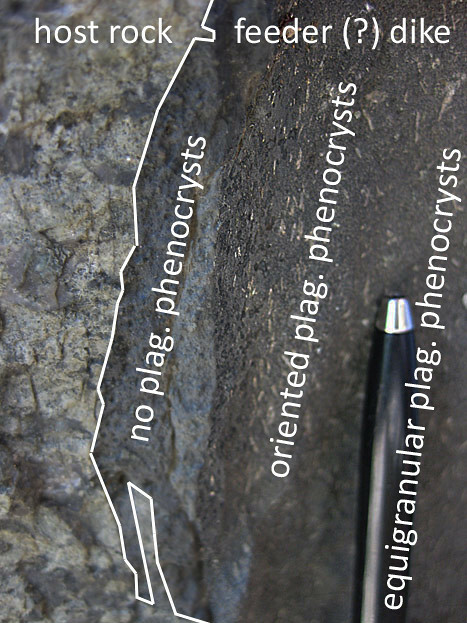 The NNE-oriented extensional fractures are the younger set, and are interpreted to have formed during Mesozoic extension accompanying the breakup of Pangea. 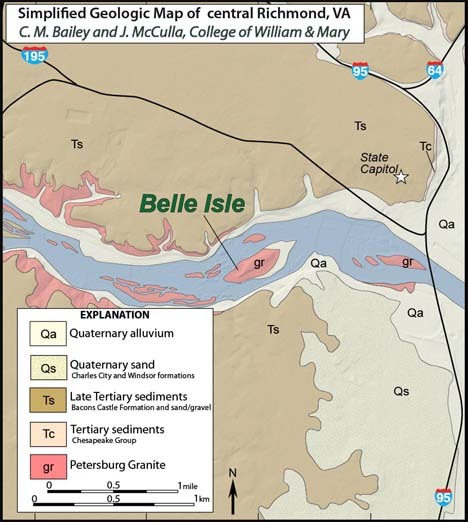 Last Friday, NOVA colleague Victor Zabielski and I traveled down to Richmond, Virginia, to meet up with Chuck Bailey of the College of William & Mary, and do a little field work on the rocks exposed by the James River. 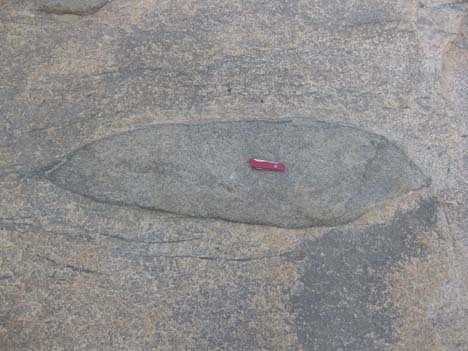 Our destination was Belle Isle, a whaleback-shaped island where granite has been quarried for dimension stone for many years. The island has also served as a Confederate prison for captured Union soldiers during the U.S. Civil War, and later for various industries. 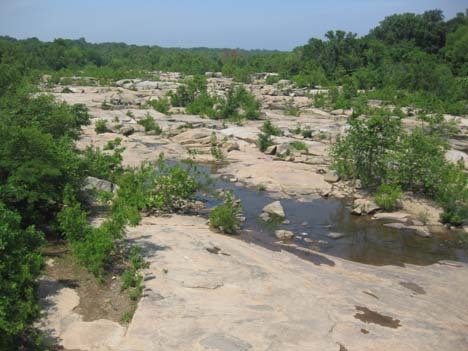 Today, it is preserved as park land, utilized by a wide swath of Richmond’s populace for recreational activities, both licit and non. 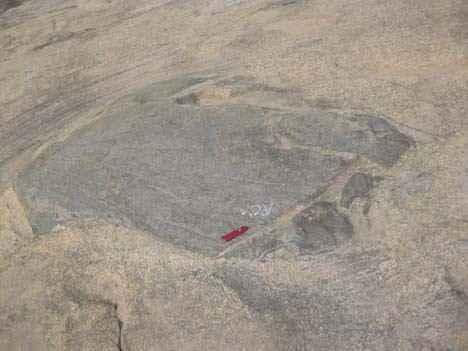 This is an Alleghanian pluton, ~320 Ma, and quite large: it extends for tens of kilometers north and south (Petersburg, the namesake locality, is to the south). 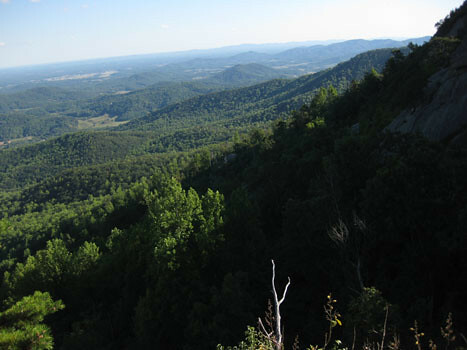 It disappears beneath the Coastal Plain to the east, and beneath the Richmond Basin (a Triassic rift valley) to the west. You can see from the photo above that in some places the Petersburg Granite is massive and equigranular, and in other places it’s “foliated,” with long dark lines running through it. 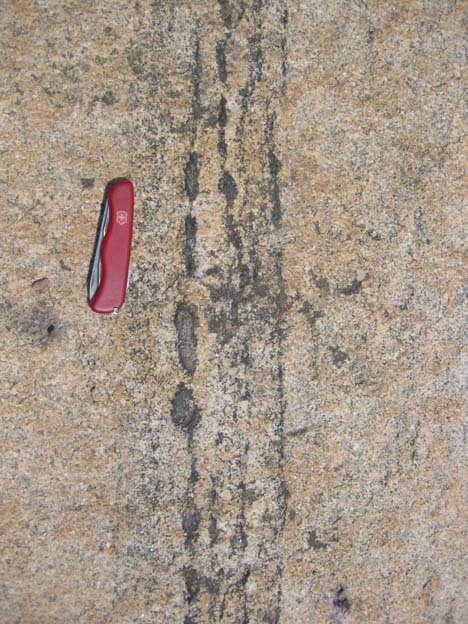 These lines are schlieren, curtainlike zones of differing mineral ratios: more mafics than felsics, for instance. 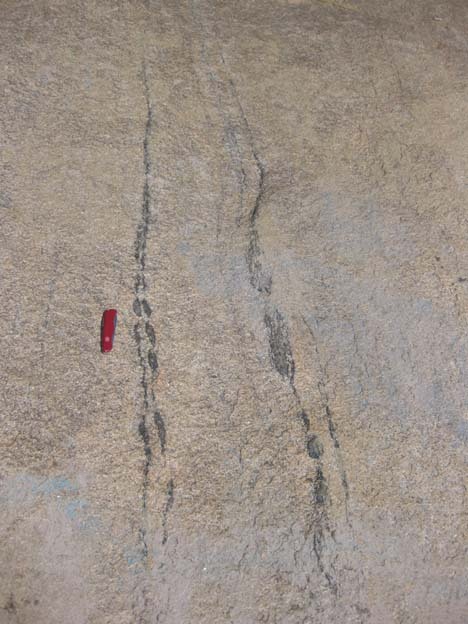 The schlieren (German for “lines”) are usually interpreted as magmatic flow structures as higher-temperature-crystallizing mafic crystals raft together in a more felsic flow. 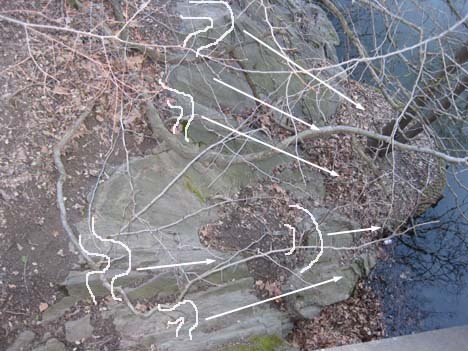 At Belle Isle, the schlieren are steeply dipping and trend NNE. 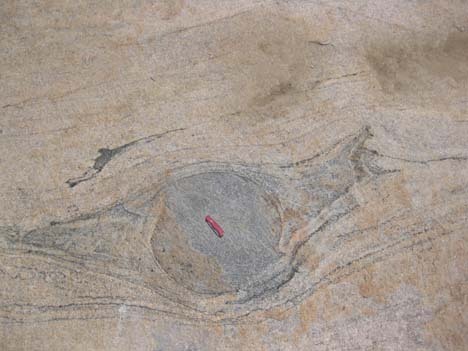 How should we interpret these mafic inclusions? 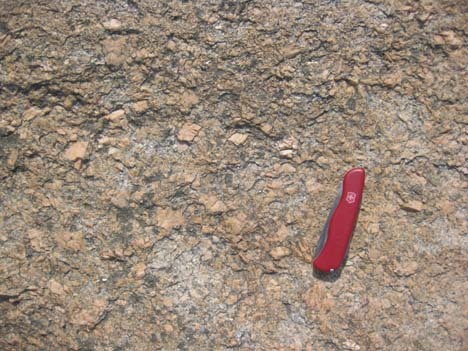 Are they xenoliths; fragments of country rock that were broken off and included in the intruding granitic magma? 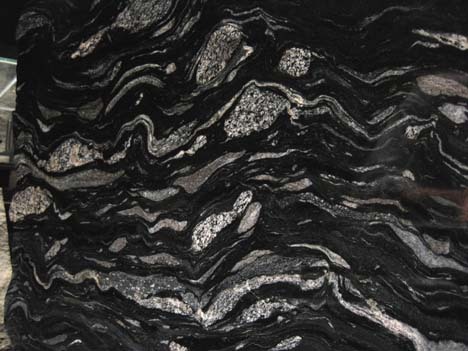 Or do they represent a plutonic emplacement process — perhaps an earlier stage of crystallization, or an immiscible bolus of mafic magma floating like a lava lamp blob in the surrounding felsic melt? When they’re fine grained and lacking internal structures, as with the above examples, it’s really hard to make that call. That rules out the fluid-blob-within-another-fluid hypothesis, but is it country rock? 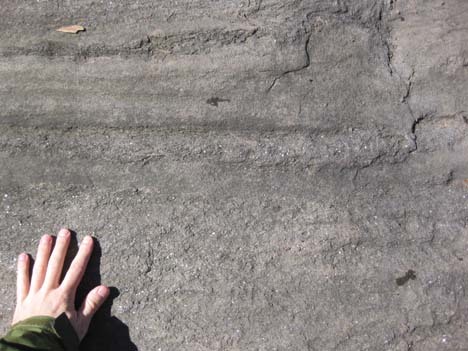 … because when you zoom in on the edge, you can see it has some ptygmatic folding inside it. 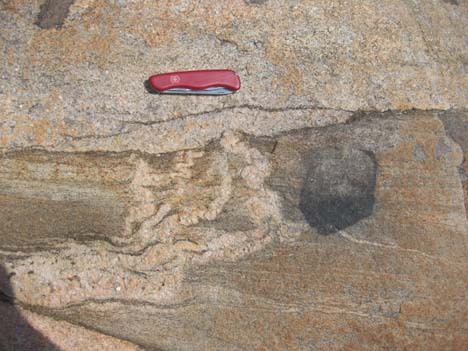 Like the foliation and the broader folding we observed earlier, this internal structure suggests that these are genuine xenoliths; fragments of pre-deformed country rock. 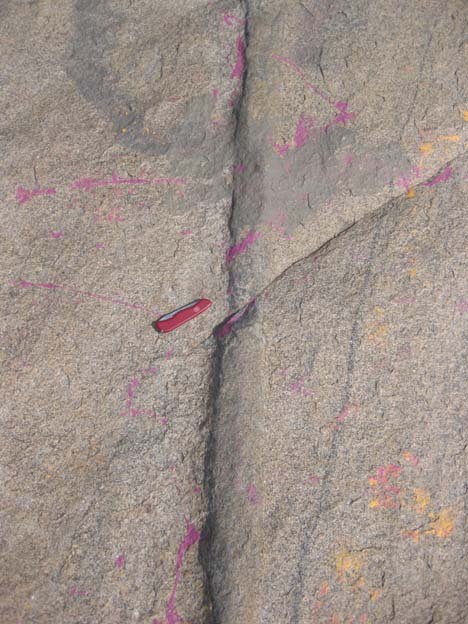 While everything I’ve talked about so far has been concordant with the dominant schlieren orientation (and thus reflective of main-stage magmatic flow in the Petersburg Granite), there are also some discordant features, like dikes, which cut across the regional fabric. What a fine spot to bring students and have them suss out the order of events! 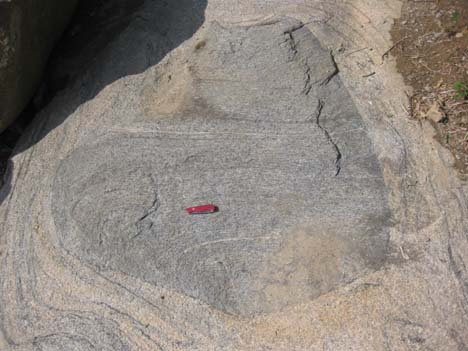 First came the massive granite, then the pegmatite dike, then the aplite dike, then sometime later under very different P/T conditions, the rock was fractured and we get fractures: some of which show an apparent right-lateral offset (faults; oriented ENE), and others where no offset is apparent (joints). 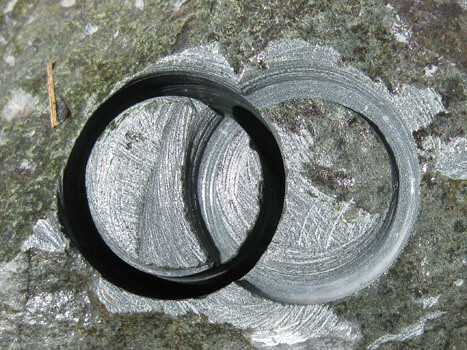 This second set appears to be utilizing the schlieren as zones of weakness, as it is parallel to the schlieren (NNE) and often occurs along their biotite-rich traces. Searching through my photo archives this morning for something suitably “Eastery”… something in pastel colors, perhaps? … a petrified lagomorph? … how about an egg, or something egg-shaped? 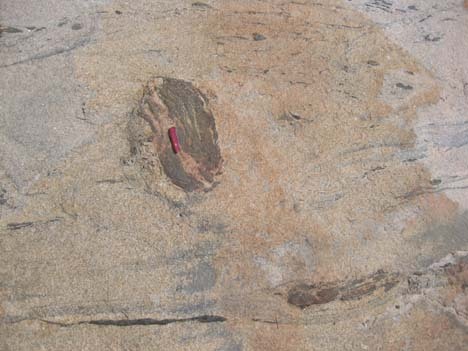 This is in the Owens Valley of eastern California, showing a boulder of the Mesozoic Sierra Nevada Batholith bearing a faulted xenolith. 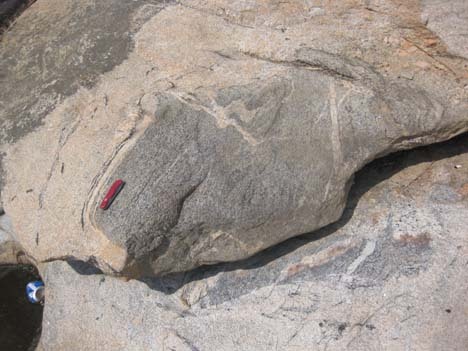 I love outcrops like this, with a combination of primary structures (like the xenolith) and secondary structures (like the fault). 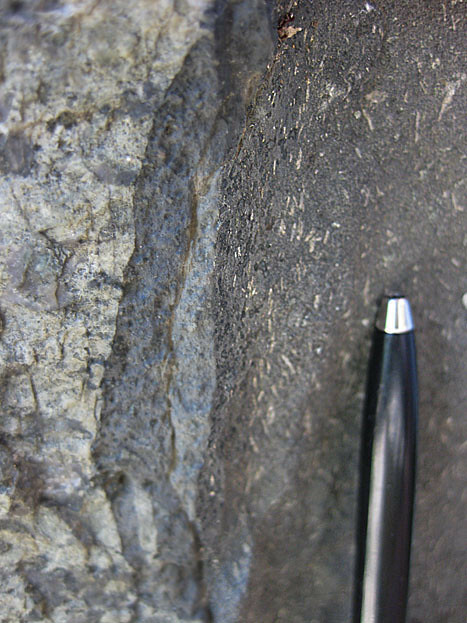 And the fault surface appeared to have hosted some fluid flow, encouraging epidotization (hydrous metamorphism) along its surface. 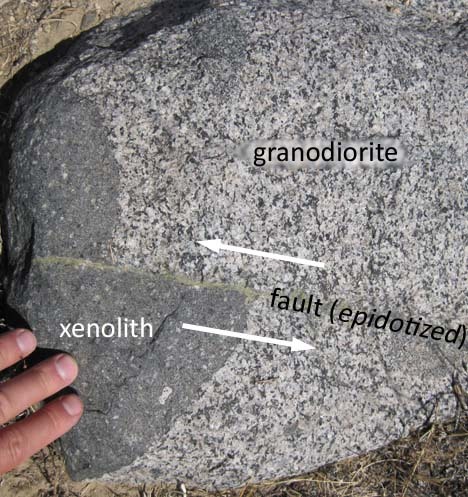 How appropriate, considering both the “cracked egg” implication of the round xenolith and the pastel tones of the green epidote. Happy Easter, folks. Focus on the bunnies and candy, and not the zombies. Thursday is ‘fold day’ here at Mountain Beltway. Such beautiful complexity! 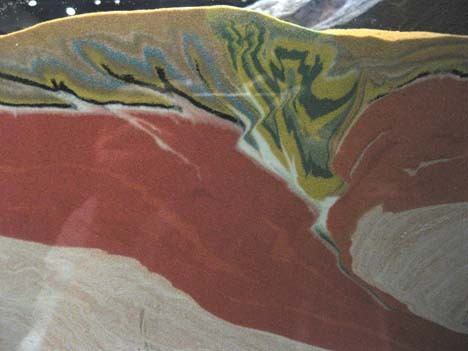 I want a sand model like this for my lab. 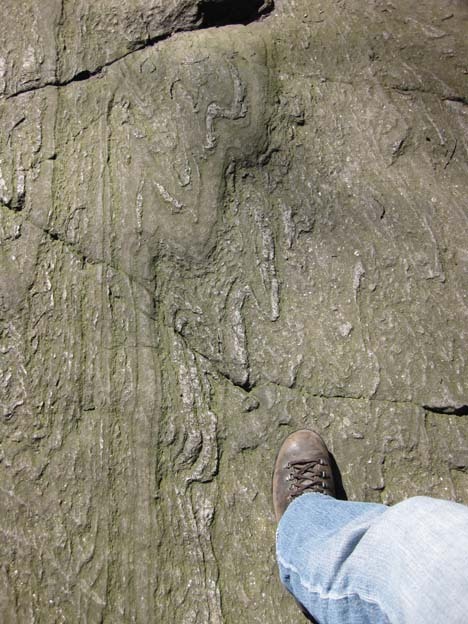 One of the cool things about being the local geoblogger is that people get in touch with you about local geology. Sometimes this even leads to meeting up for field trips. 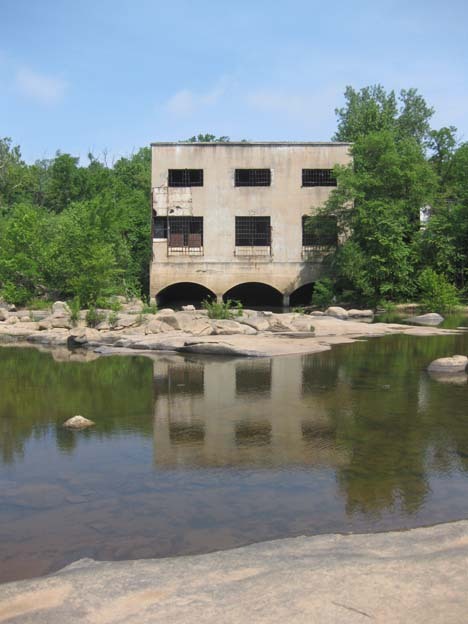 Here’s two quick photos from a recent (January 2010) field trip to a creek near Springfield, Virginia. 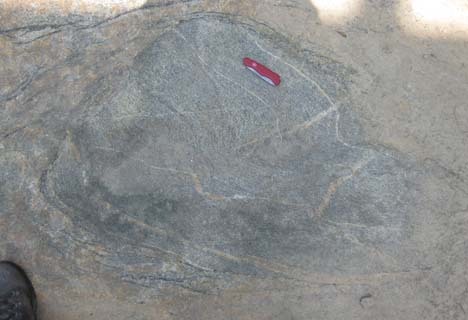 My host was Barbara X, a local aficionada of Piedmont geology. She has lived in this particular neighborhood for many years, and is very familiar with the local woods and drainages through decades of dog-walking there. 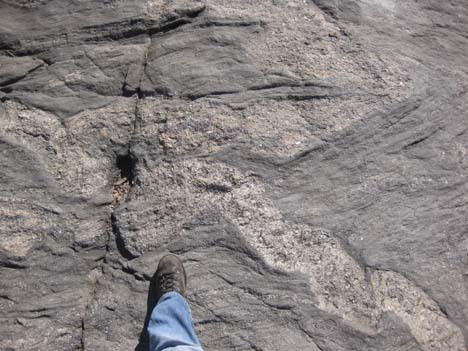 Her main question for me was “Could the geologic map of this area be wrong?” She showed me the map, and then took me out to an outcrop which clearly was of a different rock type than the map indicated it “should” be. 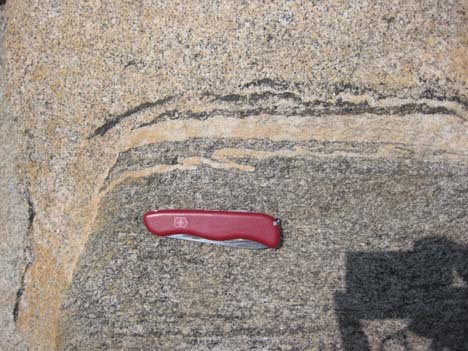 I think we’re seeing bodies of schist/ gneiss (highly foliated in cross-section), as well as coarse-grained, lighter-colored bodies of granite. 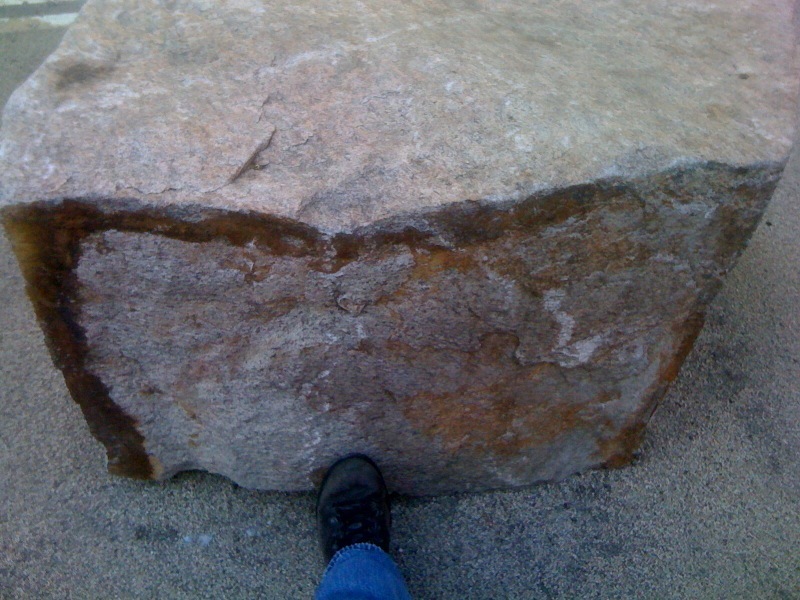 All of them have been weathered to hell: you can scoop handfuls of this “rock” out of the outcrop if you want. If you’re a plant, you can plunge your apical meristem right into it, and let the roots follow. 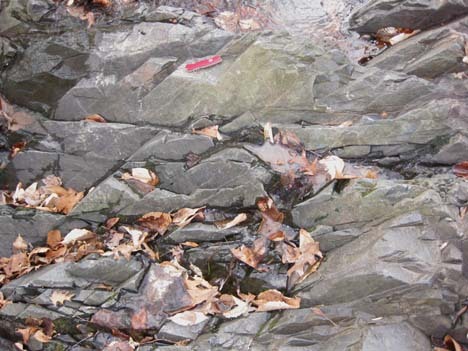 This is typical “outcrop” around here: though the mid-Atlantic region has a fascinating story (including the Appalachian mountain belt, like these rocks), the wet climate has rotted most rock away. 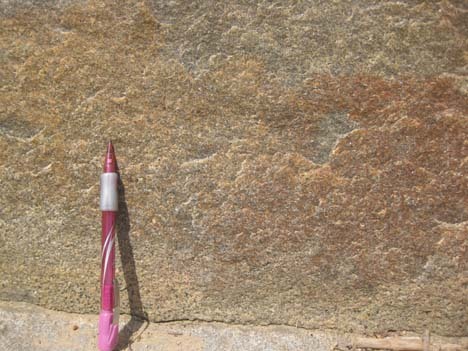 The only other thing that’s worth mentioning about this particular outcrop are the upper-left-to-lower-right brown lines: those are fracture traces decorated with rust. 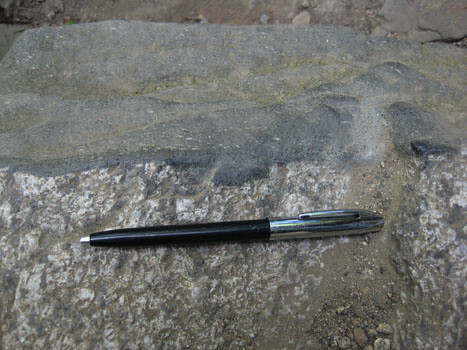 The fractures serve as plumbing to move fluids around in the subsurface, and their dissolved cargo of elements can then react with the rock on either side of the fracture.